Laura and Gary were expecting their second child, a boy. Big brother Oliver was getting used to the idea of having a baby around, and even excited about it. Laura had a baby doll she would give to Ollie to play with to get him acquainted with having a baby around. They decided to name the baby Henry Xavier as Gary is British and they liked that the name sounded British. Laura had a very normal pregnancy and was planning on having a home birth. On Dec. 21, 2014, 11 days before her due date, she felt a little off. At some point in the afternoon she realized she hadn’t felt the baby kick in quite some time. After tubby time with Ollie she started to get nervous about feeling no movement and told Gary. She decided to call her Midwife who came over as quickly as she could to check her out. The midwife could not find the baby’s heartbeat and recommended she go to the hospital immediately. Laura and Gary dropped Oliver off at his Grammy and Papa’s house in town and went to the hospital. Upon arriving Laura was admitted, the doctor’s looked for a heart beat but did not find one. They told her they believed that Henry had passed away. Early in the morning Laura was induced and gave birth to Henry naturally at about 9am. 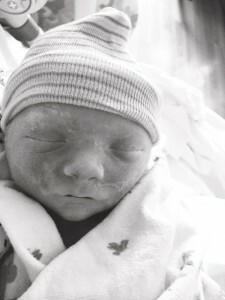 He was a beautiful, perfectly normal looking baby boy. Her doctor’s checked the baby and he was declared stillborn. Laura was told that Henry had the umbilical cord wrapped around his neck once but that this likely did not cause his death. To this day, Laura, Gary and the rest of our family still do not know why Henry passed away. It is a tragedy for our family. My own daughter, Olivia, was born two hours before Henry and I can only now imagine that they would have been very close buddies. What we do know is that he is as much a part of our family as our own living children and he will forever live in our hearts and guard us as our guardian angel.